As someone who loves makeup, but doesn't wear too much of it on a daily basis, I have become ridiculously picky with what brands I choose. It has to be non-toxic, super natural looking and hydrating for my dry skin - a list that is quite difficult for a brand to check every mark off of. Up until this point there have only been a handful of brands that have fully worked as base makeup for me - the Gressa Minimalist Corrective Serum Foundation as well as the RMS Beauty Un-Cover Up. 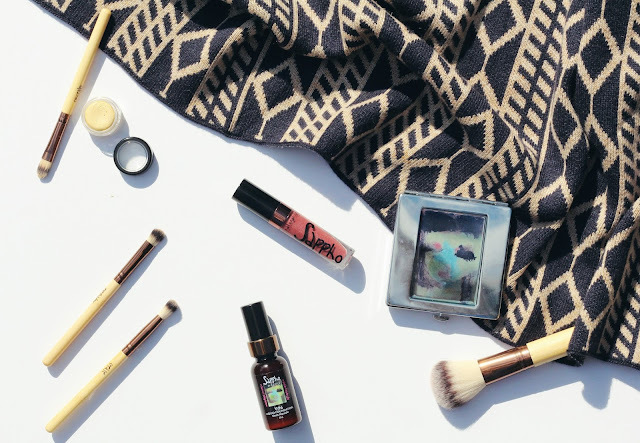 Well folks, I'm happy to say that I'm adding another brand to that list, because I've recently fallen in love with the natural cosmetics of the gorgeous Sappho Organics. 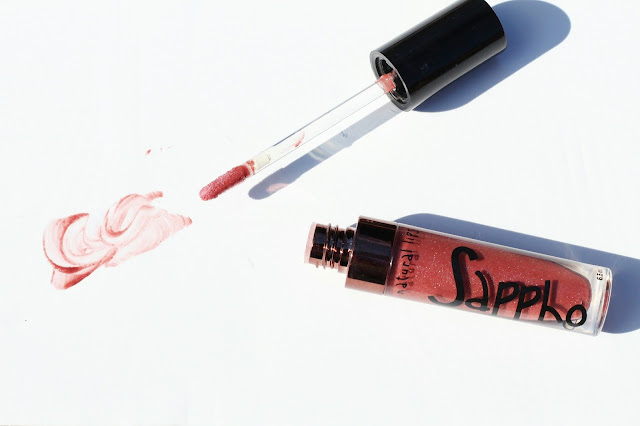 Sappho is a Canadian brand that was actually started by JoAnn Fowler, a professional makeup artist who has worked on television shows in the past such as The L Word. She started Sappho after frustration with finding natural looking makeup that has great ingredients, so she decided to take matters into her own hands. I've been trialling a good chunk of the line for the past month or so now and, suffice it to say, I've fallen in love with every single bit of it. First up let's talk a little bit about the eyeshadows and blush. I've been trying out their power blush in the shade Tutz* (a cool, light pink) and their shadows in the shades Raven* (a dark black with a hint of blue), Patricia* (a dark purple) and Turtle* (a near white). As you can see above, each comes in a little metallic pan that can be put into their gorgeous Stainless Steel Magnetic Compact*, a lovely little compact that includes space for products as well as a great mirror. 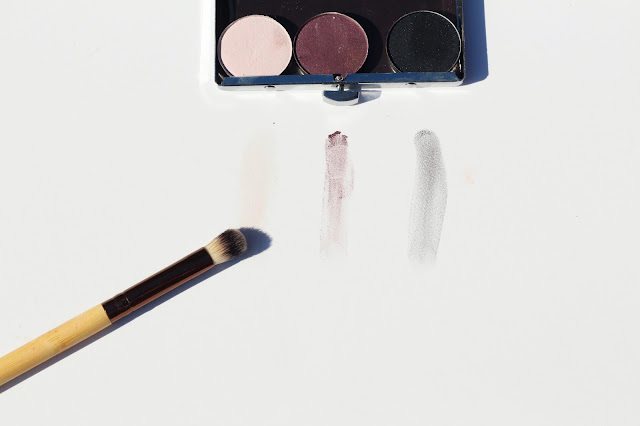 All the shadows and blush are pressed powders that are packed full of great ingredients as well as some serious pigment. They also work superbly with the brushes from the line, which are all incredibly soft and pick up just the right amount of product. 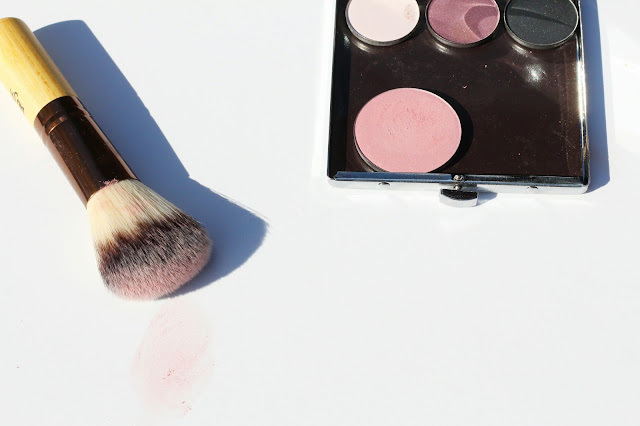 Right now I have the brushes for their Blush*, Eyeshadow* and Crease* and I've become straight up obsessed with each and everyone - seriously, I use them each daily. Another product I've been using on the daily has been their Lip Gloss* which I have in Rita, a soft plum shade. With a little bit of a shimmer and a totally vegan formula I knew off the bat that this gem and I would get along just fine. I love wearing this on top of other lip products for a shiny lip that's perfect for fall . It's just pigmented enough that it can be worn over something else but still add its own color - I love it. Equally impressive is the brand's Undo Concealer*, a creamy formula that I apply underneath my eyes using their Concealer Brush*. 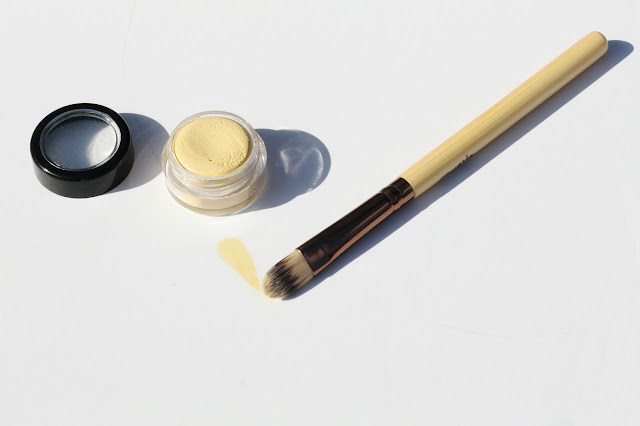 Sappho carries two different concealers meant for different purposes, and this yellow-tones cream is best suited for covering up dark circles. With ingredients s much as olive oil, tea tree oil, rosehip and vitamin E it's a super hydrating formula that provides great coverage underneath your eyes without ever seeming heavy. I'd compare the amount of coverage and the consistency to the RMS Beauty Un-Cover Up, though this is only available in the two shades (the other being a more neutral meant for covering up blemishes). While I love the concept in having just two shades for two main purposes, I'd enjoy seeing a full range of shades and colors of the formula so that every skin tone could enjoy it's fantastic benefits. Of course I'm saving the best for last, because as dreamy as all the products of this line are I have been simply blown away by the star of the line - their Liquid Foundation*. Available in 8 different shades, I am a fairly accurate match to the second lightest shade Leisha, which is said to suit light complexions with slight olive undertones. While I have mostly neutral undertones the formula for this is pretty adaptable and never does the shade look "off" on me. Speaking of the formula, it's a good one. Natural minerals are suspended in a base of (among other ingredients) aloe juice, jojoba oil, calendula and vitamin E making this a true skincare hybrid. Unlike the similarly formulated Gressa Minimalist Corrective Serum Foundation, this is a less runny liquid, though I find both formulas can be applied great using either your fingers or a buffing brush. It gives your skin the look of being "your skin but better", a very much overused term, I know, but it applies very accurately here. I'd describe it as a semi-matte, luminous finish that lasts for hours. I never thought I'd find a base that I love as much as my Gressa foundation, but this is a truly dreamy choice. I've been alternating the two of the past several weeks and honestly love each in their own way. 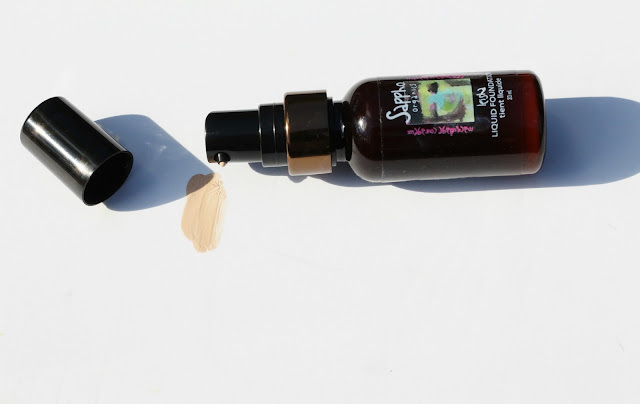 Have you tried Sappho Organics yet? I'd love to hear your thoughts in the comments below! And be sure to keep up with all their latest on Twitter and Facebook. I need to try this asap. Do you think I can find it in Europe? Or does it ship internationally?